A good children’s book is often seen as one that can either inspire or educate. A better one will do both. Such is the case with The Little Things that Run the City - 30 amazing insects that live in Melbourne!. Co-authored by Kate Cranney, Sarah Bekessy and Luis Mata, and published in partnership with the City of Melbourne, this exceptional book provides children with the opportunity to discover some of Melbourne’s most wonderful insects – some well-known and others less so – and will also inspire them to seek out the world of ‘little things’ that goes largely unnoticed. Luis Mata describes how the inspiration to write the book came while conducting fieldwork with co-author, Kate Cranney, for the original The Little Things that Run the City project. While outside observing some of the incredible insects of Melbourne, both Kate and Luis were questioned by children and their parents passing by about what they were up to. He explains that ‘Kate and I really enjoyed the opportunity to take a break and explain to both the kids and their parents some of the fascinating things we we’re learning by observing the amazing insects that call the City of Melbourne home.’ It was these ‘…enthusiastic children and their supportive parents [who] were a true inspiration to develop the ideas that led to The Little Things that Run the City - 30 amazing insects that live in Melbourne!’. Kate describes how '...kids love insects: spotting butterflies in the park, the sideways sway of a praying mantis, or a huddle of sawfly larvae, all rearing their heads. It’s no accident that Bugs Alive! is one of Museum Victoria's most popular exhibitions.' This is indeed something that can be easily forgotten by us adults - kids love discovering these little things in the garden or the local park, and are invigorated by the opportunity to learn more about them in an outdoor setting. In this special publication, Luis’ up-close photographs and Kate’s stunning illustrations provide a rare opportunity for readers to learn about and admire some of Melbourne’s wonderful insect life through both a photographer’s and illustrator’s lens. 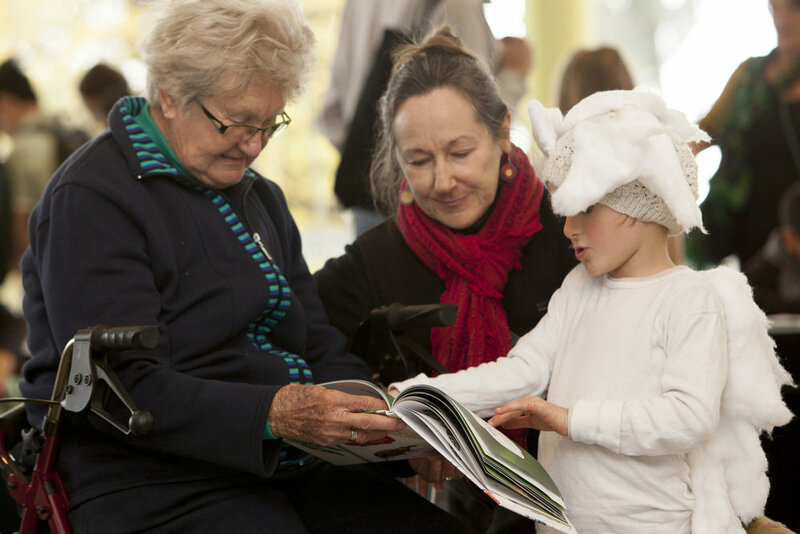 Moving from page to page, children will find themselves learning fantastic facts about the little things of our city. From the mesmerising hunting techniques of the Garden Praying Mantis and the ability of Long-tailed Sawfly larvae to turn leaves into skeletons, to the unassuming beauty of the Bush Cockroach and, my personal favourite, the sneaky breeding tactics of the alluring Checkered Cuckoo Bee, this book is packed with information that’s presented in an incredibly digestible format. But appreciating Melbourne’s insect biodiversity isn’t just about admiring their looks and behaviour. Luis explains how ‘insects are a fundamental component of nature in our cities’, especially when it comes to ecosystem services such as pollinating flowers and keeping plant pests at bay. Arguably, these insects are part of what makes Melbourne such an impressive city and allow both visitors and those that live here the chance to appreciate life on a smaller level. We often hear of children already being fascinated by the little things from a young age, such as the insects in their own backyards. This is an interest that sometimes seems to dissipate with age, and so a book like this will hopefully do wonders for those kids who want to retain that interest, or motivate those who are yet to develop it. Luis believes that as parents, it’s important to ‘keep providing… opportunities to remain in contact with nature and to keep highlighting the positive aspects of insects…’ throughout children’s lives. Adults are often guilty of dismissing native insects as nuisances, but it’s important to remember that for children, these animals can be the most fascinating part of enjoying the outdoors and that what we may see as pests are actually vital role-players in our local ecosystems. This book is really the first of its kind and will hopefully result in other, similar children’s books with a focus not just on Australian wildlife in general, but local wildlife. As co-author Sarah Bekessy explains, we need to do more to make our Australian cities ‘unique’. Cities around the world are becoming more and more alike, and embracing local biodiversity ensures that we don’t lose what is special about Australian places. As demonstrated by the minuscule Melburnians described in this book, there is much to love about our insect biodiversity alone. Imagine the possibilities if we extended this to all groups of animals, plants, fungi and made it clear to both residents and visitors that these are what make our home extraordinary. Sarah hopes that readers see the book as ‘a beautiful, compelling piece of work’ and describes the feeling of readers declaring their excitement when spotting the illustrated insects with their own eyes. As she tells me, ‘it’s all stuff that you can actually see yourself’ – again, the idea of what’s local is ever-important. Finally, I asked Luis whether he had a favourite insect featured in the book. 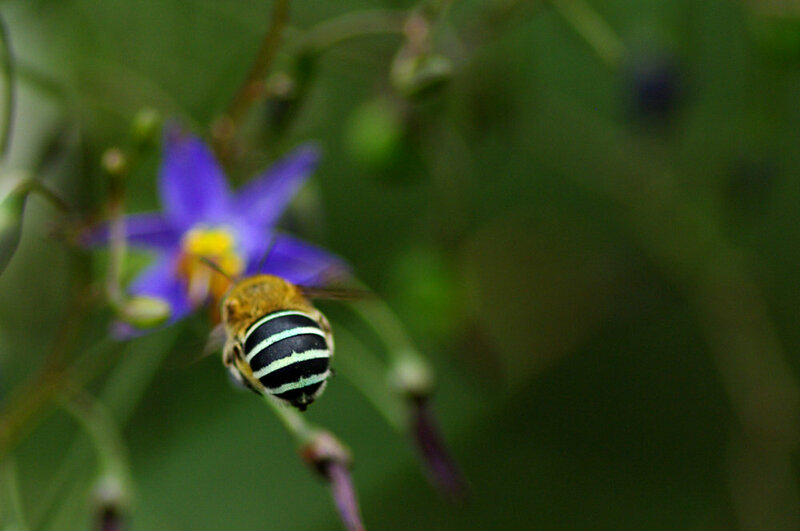 For him, it was the Blue-banded Bee. The photograph used to illustrate this species in fact marks the moment when Luis first saw this unusual bee during the Melbourne Bioblitz in 2016. He tells me that he will ‘…never forget how exciting that moment was, seeing those extraordinary, beautiful blue bands contrasting sharply with the alternate black ones. And the agile, graceful way the bee flew from one flax-lily to the other – a truly amazing experience!’ This is hopefully a joy that more Melburnians will share after learning to recognise our city’s distinctive insects using this remarkable book. 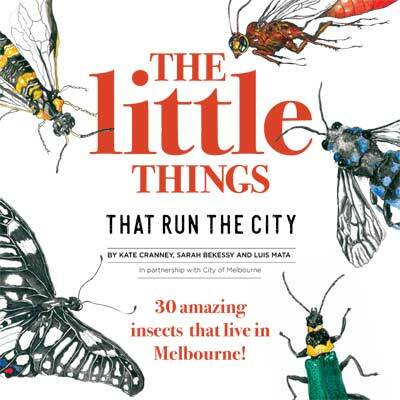 You can download the eBook edition of The Little Things that Run the City - 30 amazing insects that live in Melbourne! at this link, or purchase a hard copy edition at Melbourne’s Royal Botanic Gardens gift shop or the Melbourne Museum gift shop. Banner image of a Brown Darkling Beetle courtesy of Luis Mata.